Here are a few sites that are using PmWiki to successfully meet their web needs (also see references, PmWiki Users, Pmwiki Friendly Hosting). This list is sorted alphabetically, please add your site accordingly. Aardwolf is a large multiplayer game online since 1996 with hundreds of commands and player abilities. PMWiki has been a fantastic tool for organizing our game data and allowing players to share information with others. Offers childrens programs, harvest and other festivals, biodynamic spraying services and now localvore farm product delivery service (via ZenCart) to drop-off points in the region. AegeanLinux is a Linux Distribution aimed on being easy to use, stable, safe and secure. AegeanLinux uses PmWiki because of it's simplicity. Although we have looked at more full blown options such as MediaWiki, nothing has yet beat PmWiki in terms of ease of use. This Danish Wiki focus on the upcoming oil crisis in the world, the "Peak" that will (or has) occour(ed). We are a non-profit organisation that focus on informing the public in Denmark on the consequences of a society without any sweet-oil left to use. AITopics is a virtual library of resources for students, teachers, journalists, and everyone who would like to learn about artificial intelligence. By offering a limited number of exemplary, non-technical resources that we have organized and annotated, AI Topics seeks to provide visitors with meaningful access to basic, understandable information about AI. AITopics uses PMWiki to organize, and archive content, as well as to facilitate working in an environment with many editors. Alchemy Products Alchemicals.com is a producer of alchemically prepared nutritional supplements. We have integrated wiki into a custom zen-cart rollout. Works well as a back end interface to our mineral supplement information. Attach:ApfelWikiSShot.png Apfelwiki is a german project trying to build up a reference about working with Apple Computer like a large FAQ. The only way to let the user create their own pages was a wiki. But we won't have the same "old fashioned" wiki-look. So we decided to take pmwiki. It's a powerful wiki and with css we made a modern layout. Last but not least pmwiki is very easy to handle. http://wiki.khotty.ru based on Pmwiki is the public site for photo amateurs to experience exchange. Clear code of Pmwiki is the best choice for these goals. Thanks for great project! The Audi100.Selbst-Doku.de is a german/english self documentation site regarding the Audi 100 (type44, C4) and A6 cars. It's users have collected 500+ detailed topics explaining repairs and improvements covering almost every single aspect of the cars. (Body, paint, steering, engine and tuning, drivetrain, lighting, electronic motor management and so on). Archutech consulting offers PC and network services in NYC and Westchester, NY. Client wanted partial integration with OSTicket for clients to submit trouble tickets. In 2004, my brother Tom passed away in a tragic accident. His legacy included a sited dedicated to helping Hams in Arizona find repeaters in the state. This is important as it is used by the Red Cross and other emergency agencies to help assist people in need. Not being a Ham myself, I was faced with the daunting task of how to keep it going and allowing experts to keep the site up to date. The answer for me was found at a Northern Texas Linux Users Group meeting where Patrick Michaud talked about this great Wiki project he was heading up. I knew I had found the solution to keeping my brother's dream alive. With the advanced tables function and some sed and grep scripts, I was able to quickly convert much of my brother's site over a weekend. It went live just before Labor Day 2005. I still have more work to do, but now, Arizona Hams and other Hams have the ability to keep the site up to date instantly. Now I have many Hams who keep the site up for me without my having to directly make the edits myself as I did before I went Wiki. Apparently, according to one of my editors, he has become a celeb in the Ham community. And it is so easy for him to make edits too! Jan Brejcha // Interaction design is a personal and professional homepage of an Interaction Design practicioner and lecturer. He creates web-sites using PmWiki as a CMS. Used PmWiki for the redesign of a HTML-based page enabling a more comfortable and faster content editing, multi-language support, Picasa web-gallery and global navigation. Author: JanBrejcha? Betgizmo is a software and community based website devoted to trading techniques on Betfair. Since these techniques are many and detailed pmwiki fitted in perfectly, allowing our users to contribute to the general communities knowledge on trading subjects. Thank you pmwiki and keep up the great work. Attach:bilder-gucken-net-screen.jpg This german website is about my offer of tarot readings. It is aimed at customers interested in getting a reading as well as people who wish to study the art and seek instructions. There is a list of services and a collection of my texts on tarot and divination. The site uses a slightly customized Not so simple skin?. I'm using a wiki because I want to be able to easily update the site from everywhere. I selected PmWiki for it's great maintainability, it's small footprint and because it's really easy to customize. It was a breeze to set up all the features I want on the site. Thank you, Pm, for your work and thank you everyone for your contributions! This german wiki focuses on sports- and mountain-climbing and adresses beginners as well as anyone interested in climbing at all. It lists and reviews climbing spots and halls in Germany and offers a place to meet and share experiences. We used a wiki in general to be able to make adjustments to the pages even "on the road" from every computer without much effort or even html-knowledge. Also, as an open wiki, everybody should be able to add content to the site without worrying about how to do so. 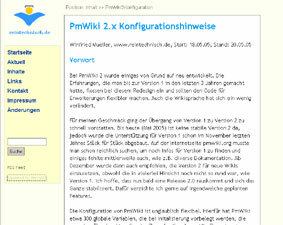 PMWiki was a slim and elegant way to get this, and we used it before as part of our main page http://www.binaervarianz.de. Budcare.org, is a free website in pediatrics and neonatology for health care students and professionals, to access quick reviews, latest news, abstracts, audio-video content, clinical calculators and others. For more, visit http://budcare.org. The Trui is an old dutch fishing ship completely restored and sailed by students of the Delft University of Technology. Here PmWiki is used as a base for the regular website and as a system to record all important data about the ship, her maintenance and an almanac of the waters she sails. Running a customised version of the Flexi skin, incorporating tabs and custom styles. This is a referral-based networking group in Orange County, NY. The website features per-member directory & category entries, and a networking calendar for both internal and external local events. I've just taken over as the website chairperson of the club, and the website has been ported, new features are being added. Ciessetrade is a commercial homepage of a machine-tool trade company. It uses PmWiki as a back-end CMS. Used PmWiki for a more comfortable and faster content editing and global navigation. (Designer: Jan Brejcha). Author: JanBrejcha? A one-stop database of information about science fiction and fantasy stories, writers etc. I got fed up of jumping from site to site to book to site etc. etc. to get information I wanted. So, starting with the books I have at home I started my database. The Downtown Management District is a non-profit organization aimed at improving the quality of life in the downtown Corpus Christi. This site, after only 2 days, has generated a lot of enthusiatic support including an article in the city's newspaper. It addressed several issues that has hampered the growth of downtown including communication among members of the comunity and the DMD, housing and quality of life issues, arts, history and tourist information, as well as a voice for direction. We feel that the site is so well tailored to PmWiki and they agree! Corpus Christi International Competition For Piano And Strings, Inc.
Corpus Christi International Competition For Piano and Strings, Inc. is a widely recognized competition open to students of the piano, violin, viola, cello, double bass or harp who are under the age of 26. This small non-profit organization required a website they can update to distribute information to prospective participants. Within one day of the site going live, the President of the organization was making significant changes to the site. PmWiki wins again! (Corpus Christi Kite Boarding Site) - This site was originally started as a strictly PmWiki site. After some development, we are incorporating other PHP scripts, and future custom apps, to make this site a truly community oriented environment. Using the Calendar from the Cookbook is great allowing all members to post upcoming events. Wiki works well for this site, especially since in the future, it will be a user maintained site. PmImg:2003/cclug-1.gif Prior to using PmWiki, the CCLUG web site was frequently out of date and difficult to update. All changes to the site had to be coordinated through the organization's webmaster, who was responsible for linking in new content and web pages (on a volunteer basis, of course). But with PmWiki, now all of CCLUG's members can participate in building the site! Visitors to the site can quickly find what's new via the site's RecentChanges page, and members can quickly and easily add new content. It's a whole new way for organizations to build and maintain web sites! These clients wanted something that would allow them to have dialogue between members as well as promote future speakers. They also wanted a website that would allow them to be able to acquire more sponsors by having web page addition as part of their reportoire of marketing tactics for pursuing corporate sponsorship. Just so happened, Wiki fit the bill perfectly here too. Set them up, make sure they like the "design" of the site, get some initial information from them, then tutor them on how wiki works. Its a no lose situation, and is making web content addition for non-html'ers and even non computer people easy. When I first started this site & it was only a dozen pages long, I had no problems with traditional website construction software. However as it grew, keeping track of everything & adding new content became harder & harder. It got to a point where I was spending more time fighting with the web design program than I was developing the website. Pm wiki has been the answer to all my problems; it is just so easy to update the site & add pages, no more messing around with complicated uploading software that is erratic, just go to the website & make the changes there & then. I have also found it to be very stable unlike the program (NOF) that I was using, which sometimes crashed or refused to do what I wanted it to do. Professional organizer and speaker, Cynthia Marsh-Croll wanted to be able to change her own content, and have new dynamic features added to her website. She eventually plans to sell audio or video seminars from her website. http://ivcitemf.webcindario.com Website del Cuarto Congreso Internacional Trujillano de Educación en Matemática y Física de Trujillo, Venezuela. Website of the program of Master of applied sciences, Design & complexity, of the University of Montreal in Canada. Using PmWiki and the elegant, slightly modified SimpleTab skin by Marian Dörk, we manage to put together a much more dynamic site than our previous one. The job of the webmestre is now more focussed on the administration of the server. The site still has to be optimized, but we are already very enthousiast about this first version. This client wanted us to maintain and keep up to date with new information and pictures that was sent to us via snail mail on a weekly basis. We got tired of being under the time gun to get the changes he sent up and running. So, we presented him with a "site revamp" plan. Just so happened part of the "site revamp", aside from improving graphics, and content, also converted his site over to PmWiki which helped us immensely later on down the road. This client is great paying, and very demanding, and PmWiki has helped us keep the stress to a minimum, the client happy. Don Trino teaches a course in conversational Spanish for the workplace at Muskegon Community College in Muskegon, Michigan. This wiki was set up by one of his students to allow collaboration among students in the class. Students have access to each others' email addresses and telephone numbers. Students may communicate through a PHPB2 forum. Class assignments are posted and may be clarified by the students themselves or by the instructor. Useful links to learning Spanish are posted. Many thanks to Patrick Marchaud for this great software tool. We've started using PmWiki to do organic documentation generation. It's been very useful in allowing a largish group of individuals to contribute to living documents. The benefit is that the live documentation is always up-to-date and no changes are ever lost, unlike email chains and word docs. Dutchgrammar.com is a website for people who are studying Dutch. It has a grammar reference, exercises, audio files, a Learn Dutch podcast, and a forum. I wrote the original grammar reference in English and Dutch learners have been translating the pages into their own languages. I used to receive text documents, which took me ages to process. PmWiki made everything wonderfully easy. Translators can now log in and translate the pages without my intervention. I think PmWiki is a great CMS. ecologeenet is the starting point for ecologic - internet solutions. As the internet-based technology makes the fastest growing consumer of electric power worldwide, we have to develop different solutions to cut the www's energy consumption down. We all love the internet, but it turns out that we can harm ourself. PmWiki is the natural choice for a typical development environment for ideas and a spot where developers can easily meat each other. On the forums we disucss and disseminate information on the Elite series of games, from the original 1980s game Elite, through the sequels Frontier and Frontier First Encounters and finally to the eagerly awaited Elite IV. ELLO (English Language and Linguistics Online) is a modular introductory courseware in English linguistics developed by a linguistic-department network of 4 German universities: Osnabrück, Hannover, Braunschweig and Göttingen. The website is designed as a study aid for undergraduate students of linguistics and consists of 15 modules covering courseware on general linguistics as well as on selected subfields. Encyc.org is a free collaborative encyclopedia intended to complement existing encyclopedias such as Britannica, Encarta, and Wikipedia. With articles on a wide variety of topics, and an active forum, Encyc.org is one of the fastest-growing encyclopedias on the web. Attach:enginuity_screenshot.jpg Scoobypedia (another Wiki site - see below) was pleased to help the Enginuity Open Source ECU tuning project redesign their website. Yes, we used PmWiki and tied authentication to the existing phpBB forum. This better shows off the fantastic software and helps the owner share the maintenance of the web site - that is the purpose of PmWiki after all. Erasmus Party Fundraising gathers international and Dutch people for a good cause once per month in Leiden, The Netherlands. The Explore Luxury site was created for people to search the luxury items on the internet directly from the designers and producers around the world. PmWiki is an excellent tool for that !!! Thanks Patrick Michaud and PmWiki team for creating such an easy and sophisticated web tool to use. SIGNAL is aimed at providing a unified training in signal processing, focussing on the fundamental research aspects of signal processing, offering the early stage researcher an in-depth knowledge of the field, not restricted to a particular subdomain of applications. Moreover, due to the strong links of the participant in industrial projects and in various types of applications, the researchers will have the opportunity to apply their results in the real world. Ferrara and Sullivan is my bestest client ever, with the possible exception of Zino Technical Services. Offering services for appeals, custody, visitation, family court, drunk driving, and all sorts of other legal services in Sullivan County, NY. For 5 years, this trivia game known as "Final Score Trivia" was played in major bars in the area, sans website, when the owner decided to expand into Ohio. My wife licensed the business from him and is continuing the Maryland operations. There was an immediate need for a marketing vehicle, both to spread into the new territory as well as keep growing the current area. There was only one problem - there wasn't any web page! They called on me to produce the web page. I considered some options, and fell on PmWiki for several reasons: first, they want the ability to make changes themselves. They're not computer-savvy, so whatever they would use, it would have to be simple to understand. I was thinking about a wiki, but there is a security issue in that we don't want regular users editing pages! Fortunately, the CMSLike recipe, AuthUser, htaccess rewrites and some help from the users list put me straight. Total work, about 2 months to get the security just right, 3 weeks for page layout and CSS, 1 week learning the GIMP (ugh! ), I'm still building the content. I also tried different skins, Flexi, Lens, and others, before settling on PmWiki's default pmwiki skin with a medium amount of mods to get the link bars to highlight, lots of fudging to make the areas fit the graphics. The best part was when I had two laptops running to test the site - one running Fedora Core 5 / Firefox, and the other running Windows Firefox plus Internet Explorer. It took only minor tweaking (plus help from http://w3schools.com) to get it to look similar on all platforms. (You'll never get it 100% the same, no matter what you do.) I now claim to know a bit of css. Oh yes, the Google map markup is super! Hats off to Patrick, Tegan, Hans, and numerous others for making all this possible. ---Created by:RussFink? ILFIRON has been focused on cutting edge IT solutions since founding in 2005. People in our team have experience with IT industry for more than 15 years and they continue to provide the partners and customers with great results and best services. We are using PmWiki for our flagship product: FlexiDoc Server. It is a combination of Apache Web server, Open Office (OpenOffice.org), Java, PHP and PmWiki in a single package. PmWiki ideally extends the features of the product for intranet purposes. FreedroidRPG is an isometric 3D open-source role playing game, similar to the proprietary game Diablo, but with an ambience of its own. It runs on Linux, Mac OS, and MS Windows. It is still incomplete but fully playable and can offer several hours of fun. We are using PmWiki version 1 to help coordinate development. GASSI-TV (http://gassi-tv.de) is the German pet-themed web tv station. We recently changed from Wordpress to PmWiki to benefit from PmWiki's open architecture and easy customization. With the relaunch of the new PmWiki-based website the pageviews (per day) have more than quadrupled. The current GASSI-TV website is entirely in German, though an English version is planned. Started this site as a small project to share our knowledge with others. Chose pmwiki because of simplicity and ease of install. Now, it has become a full-fledge commercial venture supporting thousands of users and pmwiki has scaled beautifully. It's great to have a wonderful open-source product like Pmwiki which encourages small experiments like this site and allowing it to evolve into a larger and profitable venture. Gnomehelp.org is a website dedicated to the help and suport of people who use the gnome desktop environment in the Linux operating system. We chose PmWiki because some of our members have been using this great wiki for a while and we just can't find any other wiki that is as simple and powerful as PmWiki. Thank you PmWiki! HELLUG: Hellenic Linux User Group It 's a non profit Linux User Group aiming to spread the idea of free software in Greece. Check out the HyperCard Pantechnicon. It is not very "pretty" yet, just a slight variation on what I think is the cleanest PmWiki skin. But the scope and the organization of the Pantechnicon's knowledge base is impressive. It composed of a score of groups, it manages several related projects at once, it has thousands of pages, etc. It also features many subtle innovations like the path of the page's location in the Pantechnicon's hierarchy (tree|ontology) of wiki pages. The HyperCard Pantechnicon therefore demonstrates : easy non-confusing navigation of MANY pages, excellent organization of knowledge, the importance of merciless refactoring of the content, etc. hypiaphoto.com HypiaPhoto Free web album. We choose PMWiki because we found it through the search engines and it fits all of our requirements perfectly, when compared to other wiki packages. Coupled with lots of plugins, scripts, comprehensive help files etc... compelled us to use this as the basis for our hypiaphoto.com free web space album site. HowToBeLike.com http://www.HowToBeLike.com. Howtobelike.com is a self help wiki that allows users to learn how to be like any thing they want to be. Our mission is to allow people to become what they want to be. From being like famous people to cartoons! i4 Asia Incorporated is an IT outsourcing company based in the Philippines, specialized in IT Support and E-business Solutions. We help our clients lower their costs by letting them focus on their core business, and letting us worry about all their IT concerns. i4 Asia Incorporated uses PmWiki for our Hosting Support Pages (http://www.i4asiacorp.com/hosting/). The pages primarily focus on majority of our clients' most important hosting functionality: access to their email. We've found PmWiki easy to maintain, easy to backup, and easy to use. This allows us to spend less time maintaining our Hosting Support Pages and more time supporting our clients with their more critical needs. A portfolio site for the Baltimore-based artist, Ilia Ovechkin. A Finnish wiki on innovation journalism, a new journalistic genre that is about the Future Work of society. When change has become almost the only constant in society, also journalism must become journalism of change. The top-down approach must be turned upside down so that a true citizen society will emerge. PmWiki is ideally suited for development of this kind of a site. The wiki-functionalities are used in pwd-protected projects by various groups. I am especially happy about the easy adaptability of Patrick Michaud's PmWiki program. I continually add new things to the site and take away old things, and it can usually be done in a few seconds. Just try it! It perfect, great, and easy to manage. Is a wiki dedicated to the IB ITGS course developed by its teacher and students from Cairo American College in Egypt. Over the two yrs it has grown and many schools now use it as a resource or guide. Thanks to Wiki technology and PMwiki we were able to do it. Faculty had access to web pages for over four years now, but few took advantage of this resource because of the complex nature of web site creation and management. We deployed PmWiki on the faculty server for several reasons. First, our faculty server did not have access to mySQL which many content management systems required. Second, PmWiki was easy to configure into a basic template file that could be uploaded for each account. We can create an account and upload the PmWiki in less than 5 minutes. Fourth, the ease of management made the system approachable for faculty. Fifth, faculty can create pages that are collaborative with their students or assign student responsibility to pages. Anyway you look at it, PmWiki is the perfect tool for higher education faculty. On the Home Page there is a flash movie demo showing how to do simple indexing, page creation, and page editing. www.jewelwiki.com is a collaborative resource for Jewel fans to find lyrics, albums, pictures, and most importantly live performance information. The JewelWiki utilizes PmWiki's backlinks directive to list all performances of a particular song as well as linking fans up to each other to trade live shows. We have used PmWiki for an internal project on the JeuxOnline website (the first french portail about mmorpgs) : a collaborative place for all the webmasters of the JoL team. PmWiki is really a great software, it makes the wiki more simple and convivial for everyone. One of the graphist of our team made a skin especially for us (based on the "notsosimple" template). The reading access is restricted to the members of the team (because of confidential information) and the edition privileges to the webmatsers. I can just give you a screenshot of the final version of the wiki. Knowledge Management is one way of organizing the incredible amount of information, meeting notes, and more gathered by the Instructional Technology Office in a large urban school district. PmWiki makes the job a lot easier! KWAG is Korea Web Accessbility Group. Thanks PMwiki for offering Good App. Polish tutorial on writing standards-compiliant web pages in XHTML and CSS. Thanks to PMWiki's customizable markup tutorial has rich formatting and semantic XHTML code that is good enough to be an example itself. An artists' cooperative gallery in Kingston, Washington, that relaunched with PmWiki this week. It was very easy to set up the site with a members' only section and restricted access for editing, administration, etc. I went from not having heard of PmWiki on Monday afternoon to having the site launched on Thursday morning. PmWiki is a very clean codebase that is very easy to comprehend and administer. I must especially commend you for the quality and clarity of the documentation; PmWiki stands apart from almost every open source project I've used for that reason alone. La Truffe Sauvage is a fine dining restaurant located in Lake Charles, Louisiana. The owner originally built and updated his website using Microsoft FrontPage. The restaurant changes its menus and wine list frequently and regularly promotes special events (Mother's Day Luncheon, Christmas Eve dinner, New Year's Eve party, etc.). The time required to update the website via a dial-up connection was excruciating. The owner was tired of dealing with FrontPage's limitations. After seeing the power and ease of PmWiki, he was sold. The owner is very pleased with the new site and spends far less time updating it, thanks to PmWiki. Because of the ability to easily add new pages and re-organize the website, the owner has decreased the time spent on the phone and faxing menus to customers by directing them to his website instead. We recently migrated to PmWiki our main website. We abandoned other authoring packages which, though commercial and widely used, did not provide us the trouble-free experience that PmWiki delivers. Our University has rather strict style guidelines for the visual appearance of departmental webs, and so we were pleased to discover how easy and flexible is to customize PmWiki's appearance. We are also delighted with the very direct support of mathematical formulas, greek letters, accented characters... and how all the formatings look automagically OK in all browsers. Now that's trouble-free! Our site is designed to not appear as a wiki to outside visitors, with the edit access (restricted to lab members) provided as a line of "administration" links at the bottom of the site; this is virtually unnoticed by outside visitors, yet is comfortably found by the lab people. We also find notable the small requirements of PmWiki: All the site is served by a very modest (but easy to setup and trivial to maintain) FSG-3, a network storage device that is powered by a minimalistic, PDA-class, Xscale processor. In spite of that, and to our surprise, PmWiki seems to perform well, maybe because the number of pages is not large, we keep the sizes of picture files small (this seems to be important in our setup), and use the Cookbook recipe FastCache. And this device is running various PmWiki simultaneously: It serves also various personal sites, some of them (like this one) PmWikis with different skins and the admin links completely removed in favour of AccessKeys. In summary, PmWiki (and the FSG-3) allows us simple, trouble-free web presence with almost null requirements for administrative tasks. A blog about PHP programming, in french language. It took me one afternoon to setup this blog with Pmwiki. The CommentBoxPlus recipe proved to be very handy. There are back-end administrative forms that allow Light Iris to manage this weekly newsletter-based web section's content. The rest of the website specializes in website search engine content filtering for new mothers. PmWiki was great for this task, but I had to lock out editing and make a dedicated section for that, because of a few smart 12 year olds who wouldn't stop defacing the pages with obscene stuff. Other than that, no problems at all. I altered the Page History layout a little to avoid CSS. The Lokhim Biogas Project empowers villagers of Lokhim in Nepal to improve their life. Our programme combines training with microcredit schemes to introduce Biogas technology in the village. Biogas brings the fundamental things that we in developed nations take for granted; light, cooking gas, fertilizer, and perhaps most importantly, more the opportunities to educate children. I used to run wordpress but I found that it was chunky and was hard to keep project logs and static pages updated. A good friend of mine showed me PmWiki and I decided to give it a try. I have to say this is the smoothest running website I have ever maintained. Defiantly going to use PmWiki for future sites. Powerful enough to attract hits from the Maldives, and easy enough for a seamstress to "get it" and do-it-herself! Next on the list is integrating the social networking site buttons and adding PayPal support. This has been a wonderful experience to dive into the open-source community. I modified the tag on the bottom of the site to say "Open-Source and Fancy-Free with PmWiki" I LOVE my website. Thanks to everyone in the PmWiki community! The Mapuit Xiao-o wiki is an GNU licensed online information platform for Chinese speaking communities in Europe, it started by creating an information board for abroad studying Chinese students/scholars in the Netherlands, and will gradually move to a Europe-covered information center. The site covers a wide variety of information including higher education systems(colleges, schools, institutes), tourists(city tourist, site visiting, etc), cultures(festivals, histories) as well as mostly importantly, the students' daily lives(shopping places, administrative procedures, visa application, etc). Matrioszka (Polish for «matryoshka») is a website about Russia, Russian language and culture intended for Polish audience. It is my personal, not-for-profit project I started in 2005 when, after returning from Moscow, I found out that there is no decent source of such information and a niché exists. Originally, I used Mambo (now Joomla, I suppose) as the CMS backend, which I even ported to PostgreSQL at that time, but was unsatisfied with the outcome (it worked fine but there was too much hassle with editing -- it's an interface issue). My goal for Matrioszka is not just to create a place where I can put some articles I wrote, but rather to provide a platform where other people can write too and be reasonably credited for this. To facilitate editing and increase flexibility I have ported Matrioszka to PmWiki. From the technical side, which probably interests you the most, Matrioszka is not a single website but a WikiFarm that also hosts my other sites, ie. my homepage, a website about Lviv, and some other one too at the moment, and can be easily extended to more in the future -- it is as simple as issuing an mkdir sites/www.example.com/ and creating a local/config.php in this directory. The site-dependent config.php file has virtually just a few lines, as most stuff is configured site-wide in farmconfig.php, extconfig.php (loads extensions, included from the site config.php), and i18n.LN.php which contains all the language-dependent stuff (LN stands for language, currently en or pl). All of this is possible thanks to PmWiki's excellent flexibility (virtually no need to modify the core code, except removing inline CSS and customizing the error message). Apache's mod_rewrite is also involved. The Cookbook extensions used are: Beautifier (not really needed at the moment), CommentBoxPlus, MarkupExtensions, Flash (again, not in use now), Cookbook:LinkTitles, MediaCat, MergeMetaTags (disabled for now, not working), PageToc, SearchHighLight (originally not Unicode-clear, but I implemented a lame fix), UserAuth, PresenceAwarenessLight (turned off for now), RandomQuote and ViewModes. I have also rewritten the VisitorsLogging script for use on this page. Piotr Szczepanski? This is my favorite - there's a scrapbook section on the site in which each page has a link that can be dragged to the bookmark bar and used to clip urls to the page. Thus, students can create their own custom "link dumps." In short, PmWiki is a complete wiki plus a powerful CMS for classroom contexts. It's far more flexible and robust than the proprietary software offered by many university IT departments. I do hope that the next release of PmWiki will contain built-in blogging tools. To combine the ease of blog content management (and the social networking potential of a blog) with the slow, cumulative growth of a wiki -- now that would be a powerful tool! Wikis are still on the cutting edge -- in many ways, all those fancy Web 2.0 apps are still catching up. But the more PmWiki can be integrated with existing social web tools and methods, the more people will come to see the power of wikis. PmWiki enables me to manage a site for many diverse projects: my ever-expanding collection of cds, info, scores, tabs, lyrics, and downloads... My tarot card research and experimentation... My blog... My resume and contact info... My photography gallery... My random pieces of writing... A private section for important back-ups... NOT TO MENTION THE VARIOUS NEEDS OF THE OTHER FIELDS OF MY FARM! PmWiki is the greatest Wiki engine ever... And I've tried them all. Literally! Based on nearly unmodified pmwiki for easy administration (i.e. updating content). Great software! MeteoBrallo is a dual wiki. First allow to know more information about Brallo di Pregola weather (BdP is a nice italian village). Second describe how to setup an embedded PC to support and connect to the Internet a weather station using ONLY linux and opensource software. This is a non-profit health care center in Orange County, NY. Each page is offered in both English and Spanish, with one-click to see a page in the other language. Local Rotarians wanted a website presence to honor their club. Frustrated with his franchise-supplied website, Minuteman Press came to Eclectic Tech for a dynamic website that would fit the corporate colors supplied by the franchise. Now they can change whatever they want on the website. Mobilisation Montpellier Site de la mobilisation à l'Université Montpellier 2, contre la LRU et la casse du service public d'enseignement et de recherche en France (printemps 2009) This wiki deals with the struggle against the laws destroying the education and the research as a public service in France, this is the local website for the organisation of the struggle in the University of Montpellier 2. the skin is a minor modification of the default skin (recent changes have been put in the sidebar, there is no image,...). By the way, there is a little problem with the french internationalization i18n-fr.zip since the files for PmWikiFr are not in UTF-8, so you will have to use iconv (otherwise the accents are not well displayed). The website of MPS Mountaineering at Nottingham University. Having a single webmaster led to a stagnating website, but now everyone in the club contributes to the website, and we have more content updated more regularly than ever before. The personal site of amateur writer José Geraldo Gouvêa. Hosts his fiction projects, some poetry and hundreds of "rant" pages about diverse subjects. Made with PmWiki since early 2006, in Portuguese only. With this website, Newburgh Envelope clients can upload files for the printing company with a simple password and filling out a client form. Once in, they can upload as many files as they would like. Upload system uses 100% PmWiki parts and labor, with some PmForm data gymnastics and page permission tomfoolery to keep the public from stumbling on customer's data. Not one line of PmWiki code was altered in the creation of this web application. Attach:NHSDWIKI.gif New Hope Solebury is using this as a way for teachers to create their won webpages. We love the ability to secure the sites to different levels of access this is very important in an educational environment. Nirog.info] - Health Facts in Hindi. NotPraveen.com is the personal website of Praveen Raghavan with some personal reflections. It also contains a summary of philosophy, psychology and other stuff. It also has some information regarding VLSI, Low power DSPs, Embedded Systems, System Design, Complexity theory etc. The critical need for this outdoor concert venue was a site that offered up-to-the-minute concert information. When we explained PmWiki, they knew it fit the bill. Everything is customized here, from the markup that formats the concert dates with a single tag to the automated stagger of concert act images on the calendar to the audio/video links. When the manager was in Kansas and found out that a new show had been confirmed, he was able to upload the new image and update the information from his hotel room. It was then that he realized just how powerful PmWiki is! They are sold on it! The most fun design feature of this website is the panoramic photo in the header. Go ahead, stretch the site horizontally -- will it ever end? You probably need over a 24" monitor to see the entire photo. This beautiful photo of the Shawnagunk Mountain range in Orange & Ulster counties, NY is one of the hundreds of reasons Orange Environment MUST prevail against the enemies of our beautiful natural sanctuaries. 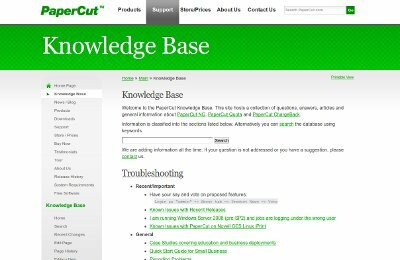 Here at PaperCut Software we use PmWiki as our support knowledge base for our print quota product. A knowledge base by nature is constantly changing - information is always being added, removed or changed. Out of the many different wiki and CMS systems around, we chose PmWiki for its powerful simplicity. It was dead easy to set up and is easy to maintain. Since then (Aug 2004) adding new content to our knowledge base has been a breeze. It looks good and integrates nicely with our site. Paul Ellis can control the text at the upper right corner of the page by entering wiki (:data:) information on the page -- so he could have a different saying on every page if he wanted to. This company produces live plays, radio plays, events, and just about anything that has more than one person in a room -- but his specialty is arts and theatre. Myrna was one of my first PmWiki clients. She wanted a design that said "holistic" and "sports therapy" without "fluff". She thinks she can't handle websites and computers, but she takes care of her two websites just fine. Massage therapy in the Delaware Valley. Prepacked kits of edible herbal delights. Soups, pasta, dips, and more, all shipped to your door. This website uses Go-eMerchant cart and payment processing. The client had already been using their service for years, now her newly designed website still uses their shopping cart system but it's so much easier to use than cutting & pasting HTML into her website -- she just needs an item id number from the shopping cart provider, and she can add purchase buttons to her cart. The Place of Houses is a South Texas real-estate and interior design company. They needed a website that allows them to add new properties and design projects quickly and easily. PmWiki is a major part of this system, with its powerful, efficient engine and straightforward user interface. The Place of Houses can now promote its website to its customers because of the control they have over the content and the speed in which they can list new client's properties on their website. They serve the Corpus Christi real estate market and surrounding areas. projektMANAGEMENTaktuell (projectMANAGEMENTup-to-date) is the member magazine of the German Association for Project Management GPM. The magazine is published quarterly in a printed and an online issue. Its subscribers are project managers, project management consultants and trainers out of several industrial and public sectors. The online website www.pmaktuell.org contains around 500 multi-page-articles and 300 smaller book recommendations which were published since January 2000. PmWiki delivers a lot of important functionality for this online archive. All articles and book recommendations are indexed according to the International Project Management Associations Competence Baseline. All articles are linked to author profiles. All book recommendations show information and reviews out of the Amazon Partner Program on the fly. All these functionality work automatically with the help of specialized PmWiki markups. The Website works on a shared hosting webspace, is very stable and has a high performance. My name is Ian MacGregor?. I installed PmWiki for an in-house network (Linux machines) and I have found PmWiki to be the best suited wiki for my purpose. I have also installed PmWiki on my website. PmWiki installation was quick and easy and allows me to have a powerful yet very user-friendly wiki without all the hassle of some other wiki's that are out there. PmWiki is easy to use and its text formatting rules are easy to learn. Couple that with skinning ability, add-ons, security, a search facility and more and you've got one great wiki. I also use PmWiki as my blog, photo gallery and much more. Thank you PmWiki! I run pmwiki on my Zaurus pda. I changed the width variable from 600 to 230 in pmwiki.php. A Zaurus is an amazing little linux box. I run, besides some other interesting programs, apache with php support. Pmwiki has all the potential to become the standard personal pda portal. In late 2004 and early 2005, the International Society for the Systems Sciences rearchitected its web site -- first implemented circa 1997! -- into an XHTML site with sections powered by open source PHP-based software. For collaborative work, we first piloted MediaWiki. We added content for a few months, and then came time to change the look-and-feel of ProjectsISSS to match the rest of the site. (This essentially was just adding a standard XHTML header and footer to the PHP script). The ISSS is made up of volunteers, with a webmaster who is technically competent, but not immersed in PHP technogy. Staring at MediaWiki's PHP code for 20 hours produced no progress! We couldn't figure out how to change the look-and-feel to match the rest of the ISSS site! As an alternative, the webmaster requested the service provider to load PmWiki on the server, and try it out. Within 3 hours, the major customizations to look-and-feel were done, and we on to migrating content from the old MediaWiki environment to PmWiki. At the 49th Annual Meeting of the ISSS at Cancun in July 2005, we relaunched the ISSS web site, and hope to bring on some more novice users to the PmWiki world! The Qdig Web Site has been running PmWiki as a lightweight Content Management System (CMS) since April, 2004. 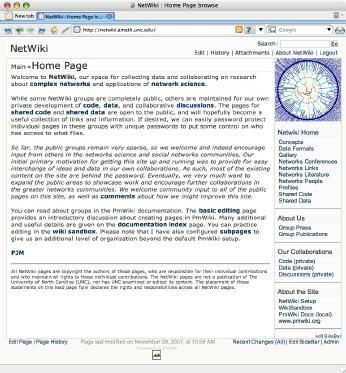 The PmWiki-based design has made the site more attractive and easier to use than it was previously. The site is easy to maintain, so the content can be updated frequently. Supporting Qdig is also easier now that commonly-explained topics (like this one) can be given their own web pages. -ProfilesHF? This was a monster website for 2007, and it's time to get moving on the 2008 conference features, which will be better than last year's. Using hidden data, PmForm -- or was it Zap back then?, and dynamic content generation, pagelists, and much more, a dynamic site was born where presenters were linked to their breakouts, the day's breakout schedule was dynamically generated, etc. See the 2007 website archive for more....100% PmWiki flatfiles -- no MySQL. Radom photo gallery http://album.radom.pl or http://radom.ws. This site is a photo gallery of my hometown Radom. I decided to choose PmWiki because it fits my needs perfectly. Each photo has own page with links to subject description and articles can be easily linked. Customized Triad Skin was used, and some self-written scripts for auto page generation for every uploaded photo and for Google Maps. This new environmentally friendly childcare facility is just outside of Warwick, NY. It's enormous and well laid-out, ready to care for children of any age from infancy up. I wish I were a kid again. The child blowing bubbles can be removed on any page by adding (:nochild:) to the page. Website: http://www.rosevzw.org/pmwiki-2.0.13/pmwiki.php Rose is an independent not-for-profit organization (called a "vzw" in Belgium). Its mission is to support and foster primary education for children from economically disadvantaged rural communities in developing countries. It is also recognized by Portulaca, the international students organization of K.U.Leuven, Belgium, as its affiliated organization. Rose has chosen to meet its mission by improving basic facilities in primary schools. To this end, it is working on well-identified and sustainable projects on a first hand basis. Rabenclan - Arbeitskreis für Heiden in Deutschland e.V. We use pmwiki in background. Design is done completly with XHTML and CSS. It is now possible to update the content with geographical diversity of people. Another Danish Wiki on the same server as the "AfterOil" site. This project is a non-profit organization that focus on bringing Broadband Internet Access to people in the rural area of Denmark "Vesthimmerland" where we live. The net is provided using wireless access. The home of the International Icelandic Rally. This is a three day motorsport event run out of Reykjavik, Iceland, hence the name. We use PMWiki as it is easy to use and gives us flexibility with the cookbook and skins. Regnum-Irae.net Gaming Community is a way for share the Game experiences with friends. We're using PmWiki as a comment engine to allow our members (and normal users) to leave comments and expand the Contents of the website. Thanks to PMWiki's, cookbooks' and skins' authors, we finally made an interactive website. PmWiki has worked out very well. A German private website with technical informations. PmWiki is used as a simple Content Managment System. Television Tropes & Idioms Wiki - Just wanted to drop a line saying that the site recently survived a major pounding caused by a combination of MeFi listing and a mention on the BBC. Something like 20,000 hits in the course of two hours were handled with no problems. Thanks for the good coding! Rock-ED is..... Live Music, Unsigned Artists, Demos, Releases, Photos, Interviews, Reviews, Gig Guides, Venues, Festivals, News and so much more. The Skin was a chop/shop work of art, with very little tweaking needed to get it working perfect for the PMWIKI skins format. We have had the Wiki running since the start of September 2005 with no problems and it seems to keep getting better and better. I tried 20~ other wiki solutions and nothing compared. I've started another major project using PmWiki and it couldn't work better. Two Thumbs up for PmWiki - Questions about my Wiki? contact me at Shlee(at)Rock-ed.com . Following the success of making the Woking Rotaract club website with PmWiki, I very easily convered the Rotaract District 1140 website to make it easier to maintain. Rotaract is a social club for 18-30 year olds with an emphasis on helping out our local community. PmWiki now powers our entire website, and makes it very easy for multiple people to update our events list, photo album and press releases from any computer. A bit of CSS styling removes the 'wiki' look so it looks like a normal website, and a bit of custom markup makes running the photo gallerys very easy (try clicking on any of the photos). Scoobypedia is a Wiki knowledge base for anything Subaru, maintained by experts - the community. It's based on PmWiki and effectively unlocks the valuable technical information burried within bulletin boards. This is a free service to the Subaru community with many good technical articles maintained by around 30 active contributors and 8,000 unique visitors per month. Schell Company is an electrical manufacturers representative for many electrical product lines. Specializing in Electrical Sales to the Louisiana and Southern United States. Wiki works great for this client because they are now keeping important information for their clients and Electrical Companies on the web. This constantly updated information helps keep superflous calls to a minimum, and also gives them more clout and presence in the electrical community. I'm very happy with PmWiki, particularly because it is a barrier-free support for my creativity: no additional software needed for editing or expanding my web site. The Sensing and Processing Across Networks (SPAN) Lab is a university research lab in the Electrical and Computer Engineering Department at the University of Utah. Researchers in the SPAN lab conduct research at the intersection of wireless networks and signal processing, and have particular emphasis on wireless sensor networks. The objective of the SPAN lab is to contribute to the state-of-the-art and disseminate research results accurately and quickly, and PmWiki has dramatically improved this output. Lab researchers directly and easily contribute results and data to the web site, and update and refine others' contributions. See more at http://span.ece.utah.edu/pmwiki/pmwiki.php. A parental control freeware for french-speaking users. Mainly used to forbid P2P file sharing, and schedule computer usage periods. The players of our game Shattered Galaxy needed an easy-to-use Wiki that people could contribute to. PmWiki gave me the best options and fast file system without needing a database. The skin came together in an easy process and from start to finish the site was ready in under an hour. We have had the Wiki running since the start of June 2005 with no problems and its so easy to maintain. All the players benefit from the information and with over 700 players we have a big community. My client, Myrna, also runs a sophisticated canine retreat in the mountains. Dogs big and small come for some relaxing music, massage therapy, and holistic care and romp with their buddies. Then they get a bath and go home. This was the first project where Silverflux created a design for PmWiki and Eclectic Tech made the design into a template. The client was thrilled, and she got onto the preferred vendor list at the Ritz-Carlton hotel because of her portfolio site. Bridal make-up specialist in the NYC and Hudson Valley region. The types of lists and content sorting done on this website are pretty spectacular for PmWiki -- this is one of the landmark websites using page text variables and related features as they were created by Patrick for dynamic content rendering via PmWiki data fields. The website uses custom pagelist formats with BaseName to BaseName-Data so that data is stored in a group entirely separate from the content displayed. Several plug-ins were created for this website: A-Z links, Page Ranking, etc. This site was created for fellow alumni members to stay in contact with each other and share their stories. This school had its 102 graduation class in 2006. Even though the school is in a small community, there are a lot of alumni all over the world. This site was started in April of 2004 using conventional HTML code writing. It was very time consuming to keep the site up to date and to make changes. In mid 2005 I utilized PMWiki and reorganized the whole site. I must say that site maintenance is much easier! EducatingChristians.org -- We wanted a site that was easy to maintain and provided our staff with the ability to make quick updates. PmWiki provided a great way to get this done. With a few local modifications we have been able to incorporate a accessible website menu system (pulling data from a page in the wiki) and a daily Bible meditation section (pulling data from a database). PmWiki has proved to be a solid foundation for this site. Software Systems Open For Business is a small software shop that uses PmWiki to give customers open source based web sites. The fact that no database is required is excellent, as it enables our customers to use basic hosting packages. The permissions is also excellent as it is fully featured yet not overly complex. PmWiki is a great piece of software, ideal when Joomla or Drupal would be overkill. This is the website of our RG d20 pen&paper Star Wars group. We use the wiki to present all of our characters, NSCs, places, starships, equipment, stories and much more. There is also a quotes and fun section and lots of adventures to read. The wiki is constantly growing and we're very proud to have created so much material already. Without pmwiki, this page would never have become so huge. This is your typical SCORE website -- or is it? It's a PmWiki website with a jumplist, wikicalendar, and Crisses business directory recipe (using PmForm, not Zap) added in. Yummy. TAMU-CC Professor says yea PmWiki! tangoskolen.no is a tango school located in Oslo, Norway. We offer training classes, practicas (tango practice nights) and private lessons, and we provide tango performances. We use PmWiki both for our external web site http://www.tangoskolen.no, and for our internal web page where we share course content, student lists, etc. TapirGames is a game studio dedicated to making fun online games. PmImg:2003/dnr-2.gif This research organization has some sophisticated web frontends to its environmental databases, but needed a way for researchers to quickly create and update content. At first glance this site doesn't look like a wiki site, but it is! The edit links are hidden beneath the banner until the mouse pointer is over them. This is a website for information related to the TI-99/4a home computer. This site is also the home of the largest FAQ for the TI computer. I used to use PHPBB as the main website software but it was too cumbersome with me being the main contributor. I changed the site over to PmWiki so I could easily edit, maintain and update the site. Since I'm the sole contributor I tucked the editing features away. PmWiki really wins out with it's ease of installation, and ease and flexibility by which it can be customized. Totally text based (no DB), it's quick and simple to setup. The author is also extreemly responsive to problems, bugs, help, and general suggestions for improvement. 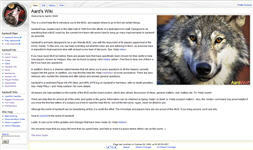 PmWiki has by far the best community of developers and users of any of the wikis. The purpose of the MR2 wiki is to provide a comprehensive source of information, facts, and answers to common questions about the Toyota MR2. The MR2 has been around since 1984, and was one of the first popular mid-engine sports cars, with a 0-60mph time of around 6.5 seconds, rivaling many modern sports cars. MR2 Wiki: A continually evolving frequently asked questions. The Travellers’ Bible is an encyclopaedic project aimed at helping travellers share information in a concise and organised way. The Title-Eigo (タイトル英語) website helps the Japanese learn English through the titles of movies, songs, books, etc. The 10,000+ members and more visitors benefit from this language-learning site, which is working great thanks to the wonderful PmWiki system with the beautiful TriadSkin and other fabulous cookbook recipes. Created and run by Jun Fukumitsu (福光潤). The Treehouse Cityguide provides Train Schedules in English, Information, a Discussion Forum, a Mandarin Phrasebook, and Photo storage for independently minded travellers. It's currently focused primarily on China, though we do plan to expand. We're using PmWiki as a comment engine to allow people to leave comments about places that they've visited, to share with other travellers. PmWiki, due to its flexible design, has worked out surprisingly well in amazing ways. Tuloso-Midway ISD is one of the K-12 school districts located in Corpus Christi, Texas. The Technology Department uses PmWiki on one of our intranet servers (Dell PowerEdge 4300 running FreeBSD 6.2) as a collaboration tool to discuss Summer Projects, the design of our Inventory System Database, and many more topics. TumkurInfo.com is an effort to make a great site for one stop info site about Tumkur. We're using PmWiki as a main engine. PmWiki, gives the flexibility of editing/adding info by anybody from anywhere. More over it works without MySql. The artwork changes when you view pages about a particular book, the sidebar changes depending on which page you're viewing, and more little features were added to this dynamic content website for a small publisher on Long Island, NY. Under Water Fishing Lights, has just launched their new site all updated with the latest version of PmWiki! The author of this site LOVES the versatility of the new template system, as well as the ease of use with style sheets. The submersible light industry has another thing coming since Under Water Fishing Lights teamed up with PmWiki. It has made creating a site, and keeping it dynamic enough to add information as needed very simple! We needed a way for multiple people to update our site easily and to facilitate communication within the church. PmWiki has served both purposes wonderfully. We are now able to keep our content fresh and enrichment groups each have their own WikiGroup. We even distribute our newsletter electronically via PmWiki. As a church of free thinkers, people are coming up with new ways to use wiki all the time. Thanks Pm! We found that our old staff web site (largely developed in HTML, often with DreamWeaver to construct pages) was getting stale. Nobody was in charge of the site and those of our staff with HTML skills were swamped enough that changes were slow to appear. We decided to try a wiki in an effort to get more staff involved in the editing and maintenance of the site. We also felt a wiki could help us enforce a template on the site. After flirting with twiki, we chose PmWiki because of its clear philosophy, clear documentation, and active user community. PmWiki has been a joy to work with. We decided to use a wiki for our officer documentation, but it expanded into the whole site. It's fantastically easy to update, and we haven't found one instance where PmWiki wouldn't work. The major sticking point was the massive PmWiki community and all of their recipes. Offered the required functionality with restrictions such as no database support. Had an active user base. I spent a lot of time developing customized web applications and, when I had to set up a new site for the VIGOR athelics, I looked around for some existing framework matching their requirements. PmWiki was the right solution, easy to customize and quite easy to mantain and populate even for non technical editors. Beautiful books, illustrated cards, and children's stories. The website offers sample pages or chapters of the books offered, and shows off some of the card designs. Tried many different platforms for this project including Mediawiki, Wordpress, Joomla and Drupal. I've a had a PMwiki running behind the scenes for projects since 2005. PMwiki is a handy tool I often recommend. A fabulous app - Love It! Representation Website for a local Federation of Freight Forwarders & Logistics Associations. We publish dates and news for members and informations about education. Using NetstreamsCMS? with a simple Blog, Menu, Forms, german translation and a lot of other extensions (more that I can count ;-)). Using PmWiki has proven much more effective than doing it myself with hand-coded PHP. First of all, it saves me the work of writing a lot of PHP code and second of all, it prevents me from being the bottleneck for getting content up online. By the way, my web host doesn't have command line access, but I am able to install, configure, and run PmWiki without any problems. Thanks! A long time I coded html and PHP myself. Editing with vi after logging in with a secure shell was not a quick thing to put some new ideas to a web place. So I found PMWiki for putting my ideas and knowledge to my own webserver just by using the browser. It was (and is) a pleasure to have a handy tool for getting ideas, knowledge and more into a webbased system. Then, somebody of my german Volkswagen Scirocco Forum (http://www.sciroccoforum.de) told me that he would like to put a Scirocco knowlege base to the web. Well, PMWiki could do this and now there are nearly 4000 people coming from the forum who are able to edit all the details about this car. Nevertheless, I'm writing tips and hints to the wiki for all things of life like SecondLife, GPS systems, VoIP and much more. It's a source for all information I have in mind or maybe should remember of. WikiHistory is an open World history online. When I decided the World needed an open history book it was obvious to me that a wiki was the way to make it happen. After some research, PmWiki was the one that was recommended. You have no idea how happy I was when it "just worked". It was easy to install, and adding skins was simple. I love it. I hope everyone helps fill in the history now! Your Green Club is a Shaklee Independent Distributor website for selling Get Clean and other ecologically-friendly products. Teaching, Learning, and Exploration of the book Zen and the Art of Motorcycle Maintenance. On my Web Site you will find photos, travel information, essays, and links concerning the book Zen and the Art of Motorcycle Maintenance (ZMM) by Robert Pirsig. I needed a way to create and update my site easily with little knowledge of webpage creation or expertise HTML Code. PmWiki has served these purposes wonderfully. It is so easy to use that I keep finding new ways to add new content AND new pages. As a consequence my site just keeps on getting larger AND gets better and better!!! To easisy display a large collection of photos (~2000), I added, by a main menu link, the Web Photo Album Presenter called Gallery. It has many great features and a wonderful Slide Show. Thanks Pm for your great webpage system1! Zino Technical Services offers PC & networking solutions on Long Island, NY. The client picked up PmWiki, asked about 3 questions, and started creating his own website content. the postage stamps club of Burghausen / Germany switched over to PmWiki. Thanks for such a fine piece of Software! I needed a way to integrate in one site a Blog, a Catalogue, some pictures galleries and other medias. It had to be easily updated by non professionals . Thanks to pmwiki, I managed to make it though I'm not a professional either.
''' Pizarra,"La Red Social de la Educación"
Pizarra, is an educative social networks created under the Web 2,0 concept, based on communities and services that foment collaboration and information exchange taking advantage of the Wiki technology so that the pages are written by volunteer through a navigating Web. We are a participative construction space of free knowledge for self - learning and education in concrete situations, at local level, regional or national. All can participate just by creating and modifying pages with only register itself. We are looking for a transformed society thanks to a better education where Pizarra is an efficient resource to stimulate educative community to be a protagonist of their own development and innovation. From Bolivia to a Spanish Castilian speak world. Pizarra in English means slate. Thanks so much for the well documented, easy to run and feature rich software, PmWiki has become! I'd just like to rave about what a beautiful piece of code PmWiki is. I'm only just beginning to realise the power of it, and the learning curve, from installing recipes, through fiddling with the CSSes and templates, to finally coding my own solutions with directives or from scratch, has been downhill all the way. That's the hallmark of an architecture that Einstein would have liked: as simple as possible but no simpler. Thanks for being gifted! This page may have a more recent version on pmwiki.org: PmWiki:SuccessStories, and a talk page: PmWiki:SuccessStories-Talk.